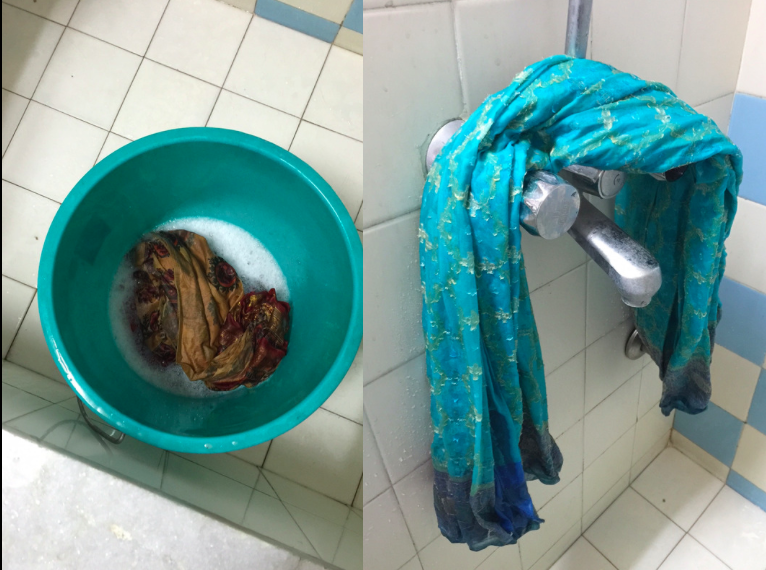 I have been asked several times by many readers of my blog and friends about washing saris at home. While for some years in between I have been dry cleaning my saris, especially the silk ones, I realised that dry cleaning damages the environment and the sari. Two of my wedding saris have been spoilt because of dry cleaning. 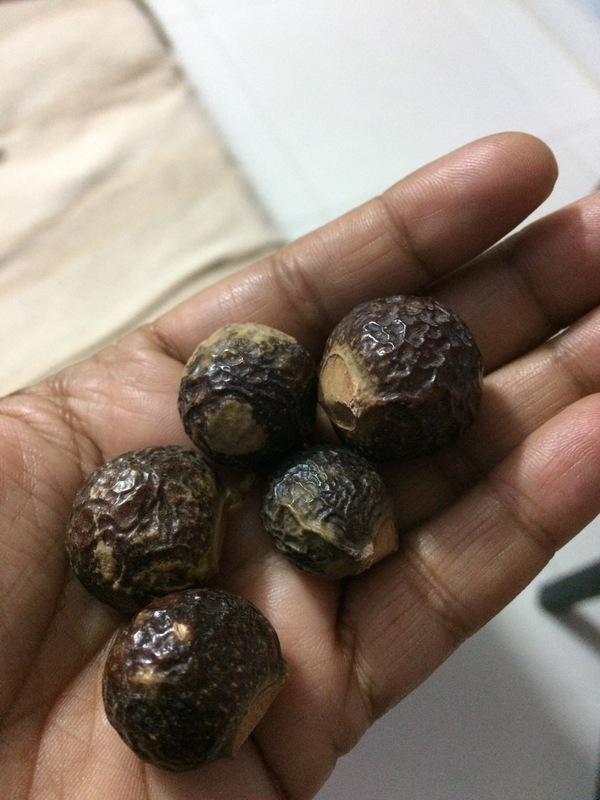 When I asked my mom and the sari shop keepers about how they maintained saris when there was no dry cleaning, I was told that they used “reetha” or soap nuts to wash the saris. I have used “reetha” as shampoo for my hair when I had really long hair. I have also used it for cleaning the gold jewellery. So for the past 7 to 8 years I have been washing all the saris at home, with “reetha” and the result is much better than the dry cleaned saris. I may have to get some of my silk saris steam pressed to remove the wrinkles, but very few saris need that. Most of them get ironed and they are fine. Soak 10 to 15 pods of reetha overnight or boil them for 15 minutes till they become soft (cooked). Remove the seeds and then squeeze the pods till the soapy pulp starts to come out. Use a filter/strainer to pour the thick soapy solution into another mug. Add a little water and squeeze a few more times. Re-use atleast three times to get the entire soapy solution from one batch of reetha pods. Dilute a little like you would do with detergent and soak the sari that you want to wash for just a few minutes. If something has spilled on your sari, you can rub a reetha pod over that spot and the stain will vanish. Do the spot cleaning before soaking the sari in the reetha solution. The water has to be cold water, please DO NOT use warm water. Soak one sari at one time – do not soak multiple saris in the same solution at the same time. Do not wring the silk saris. Just lift them out of the reetha solution and use clean cold water to rinse them and again, do not twist or wring the sari, just put them over a towel rack or the water mixer and let some of the excess water drain out. Dry the saris in shade as a single fold and preferably do not let the pallu be in contact with the body of the sari as the pallus are usually bright coloured and sometimes the color may run. If its a silk sari, wait for it to stop dripping water and become semi-dry. You can iron it at this stage for the wrinkles to disappear and then hang it out again to dry completely. You will have to get it ironed again but doing this in-between ironing helps to smoothen out the wrinkles better. Cottons and silk-cottons are much easier. The same reetha solution can be used for three saris before discarding it. If the sari has bright fuchsia pink color or other strong bright colors then dont soak beyond a minute. Preferable to wash the pallu separately to avoid color running. Soak one sari at a time. After rinsing hang them to let the excess water drip. Do not wring. My mother’s wedding saris are all maintained this way and the silk just shines … and all these saris are over 45 years old with real zari (silver threads). Even my wedding saris that were spoilt because of the dry cleaning are slowly getting the color of gold back in the borders and pallu. Hopefully I have managed to check the damage soon. Please dont get your Kanchivaram silks starched by a dry cleaner. If you love to wear stiff saris, make the effort and lightly starch them at home. The silk is so amazing that it doesn’t need any starch. Go ahead wear saris more often and wash them easily at home with “reetha”. Reetha is a fruit so doesn’t harm the environment and doesn’t need bucket loads of water either. You can even use the reetha solution in your washing machine instead of the harmful detergents. Just use small quantities because the reetha solution does foam a bit. Hi, nice article. I have been looking through google to find a solution for my moms real silver zari banarasi silk saree. The zari borders have tarnished and also have some stains. Do you think the reetha solution will halp it retain the old color? Yes Dora. If it’s pure zari, Reetha helps in removing the tarnish. Reetha is used to clean gold 😀, besides using it as a shampoo and washing solution for clothes. Thank you for your response. Now I have another question. Can you explain the whole process? Some people says to wash the border and body separately (no idea how would that be possible). How do you suggest? Where can I find reetha to purchase it? Thank you! Available on Amazon or in India, departmental stores carry it.